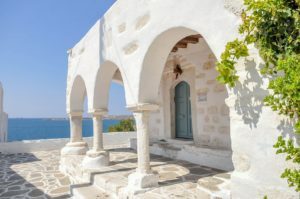 Paros in September - Is it a good idea to visit Paros in September? Paros in September is still beautiful! As our island is quite popular, the visits by travellers from around the world continue during this month. The access, both by ferry and airplane, is quite easy as the schedules are often and on a daily basis. Paros in September is definitely more alive and vibrant than other islands of Cycladic complex. All the restaurants, taverns and boutique shops are open, car rentals are operational, our hotels are happy to accommodate you. The local temperature in September is of course not as high as in July or August. As it varies between 25°C and 30°C and you can still enjoy sunbathing and swimming in the amazing Aegean Sea. The time you will spend on our amazing beaches will probably be more enjoyable due to the lower temperature. Most of local people here in Paros, say that September is the best month to visit the island. That is because there are not that many tourists as there are during the high season. Therefore, it is easier to find unoccupied sunbeds on the beach or a table in a restaurant etc. Even your evening walks among the narrow picturesque alleys are more pleasant. For photo shooting enthusiasts, Paros in September is a place to be. This is the period when the stunning photographs are "created" because of the clean atmosphere. Less humidity means blue sky, blue sea and white parian houses. If you are looking for entertainment in the extreme water sport branch, like windsurfing or kite surfing, it's probably better for you visit our island in July or August. Paros in September doesn't offer those windy conditions you might be looking for but, this is weather we are talking about. As the atmosphere is less hot, it's easier to enjoy sightseeing in Paros. Sometimes you might have to walk for a few minutes in the sun, in order to reach an attraction. Then of course, spend few more discovering it. Paros in September is more suitable for that kind of activities. You should know that no matter which month you decide to visit our island, you will be impressed not only by the landscape, attractions or architecture, but also by the hospitality of the people in Paros.